Imagine the record of all that defines you outlawed. A large part of your soul ground to dust beneath colonialism’s boot heel. In 1583, after the Spanish conquered the Inca Empire, the Catholic Church banned a system of record-keeping used throughout the Inca’s 3,000-mile swath of the Andes. Ledgers, censuses, and tax records were, essentially, erased. Histories, genealogies, creation myths, and poems were quashed. Cultural storehouses may as well have been torched. The Incas had no written language. They kept all their records on cords, called quipus, knotting them this way and that, dyeing them, gathering them together. Hundreds of quipus excavated from burial sites still exist, but because they were stamped out hundreds of years ago, what they say remains a mystery. Chilean artist Cecilia Vicuña has been crafting her own quipus for more than 40 years. 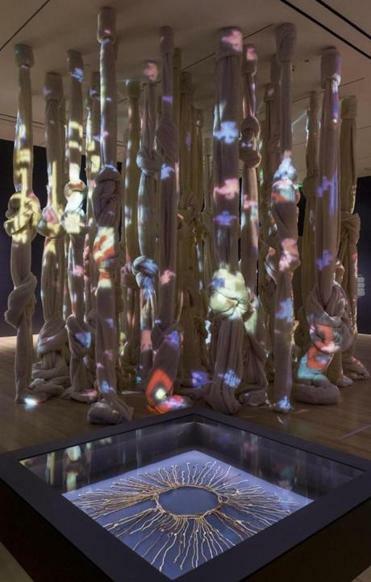 Her majestic and wrenching installation, “Disappeared Quipu,” is at the Museum of Fine Arts through Jan. 21. She brings the secret language that threatened the powerful into the halls of a Western museum — the type of institution that benefited from the plundering and destruction of her ancestors’ way of life. Here its whispers have special resonance. Vicuña’s monumental “Quipu desaparecido (Disappeared Quipu),” suspended from the ceiling, reaches into that silence. The piece fills the center of the gallery, a dark sun around which several other objects, including centuries-old quipus, revolve. Hers is made of unspun wool. She laid the wool on the floor and a team helped her cut and tie it into giant knots. These knobby, enormous strands form a fuzzy forest. The unspun wool could pull apart, yet its fragile fibers cling to each other tenaciously. Ghostly projections of Andean textiles flicker, and eight tracks of Vicuna’s vocalizations — whispers, songs, gurgles — make an audio tapestry. Vicuña shares her name with an Andean camel known for its wool. That could be a clue about her ancestors: The Andean peoples’ cosmology was rooted in textiles in a way difficult to imagine for those of us who pop into Target to buy a T-shirt. They developed wildly intricate textiles, and the warp, weft, and connectivity of weaving was their metaphor for all creation. They believed that lines extending from mountaintops connected their territories, their peoples, and all living beings. What we know of the Incan Empire we learn from Spanish history; decoding the quipus would tell us so much more. Harvard professor and anthropologist Gary Urton studies them. Recently, Urton’s undergraduate intern Manny Medrano cracked one of the knotty codes for the first time, comparing a set of quipus to Spanish census records. The radiantly arrayed ancient quipus on display come from Harvard’s Peabody Museum of Archaeology and Ethnology. Together with the MFA collection’s Andean textiles, steeped in saturated colors and rhythmic patterns of ecstatic shamans, they describe the ground from which Vicuña’s present-day apparition springs. Brutal silencing in service of power has not, of course, subsided. Vicuña was studying in London in 1973 when General Augusto Pinochet toppled the Chilean government of Salvador Allende, with the help of the US government. Among other atrocities, the dictatorial Pinochet regime dealt with political adversaries by “disappearing” them. “Disappeared Quipu,” then, is an act of reparation, a quiet rebuke to silencers through the centuries. Through singing, cutting, and knotting, Vicuña briefly recovers what has been lost, revivifies the ways of her ancestors, and resuscitates an ancient cosmology. ‘Disappeared Quipu’ is an act of repara-tion, a quiet rebuke to silencers through the centuries. I asked Munsell if the knots in Vicuña’s quipu signified particular things. After all, Manny Medrano figured out that the colors of the strings in the quipus he examined matched the first names of 132 taxpayers in a small Peruvian village. But Vicuña is an artist, not a cryptographer. She also pointed out that Vicuña’s work is not an administrative quipu, like the one Medrano worked with. It’s a narrative quipu. Its story isn’t linear. It goes around and around and up and down. It ties in knots. The voices inhabit it, never beginning or ending. From that, perhaps we can take heart that this story — this quipu, re-membered — may be precarious, but it has no end.